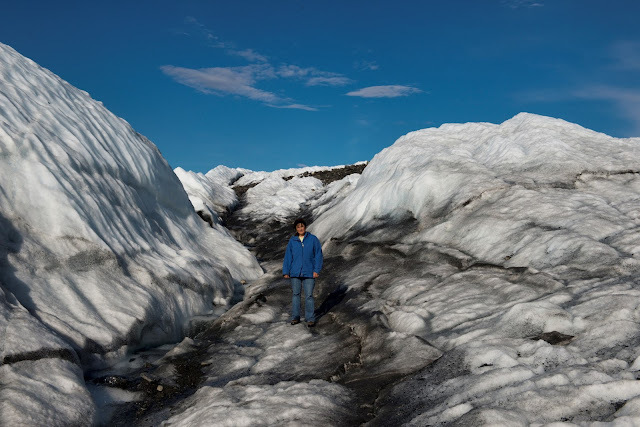 Pam and I went and visited this glacier. It is off the road a long way and the road is rough. We had decided to stay in their "RV Park"... this is in quotes because there really is no RV park. We looked and looked for a place to park and had about given up when we found parking site "16"... this was our view. 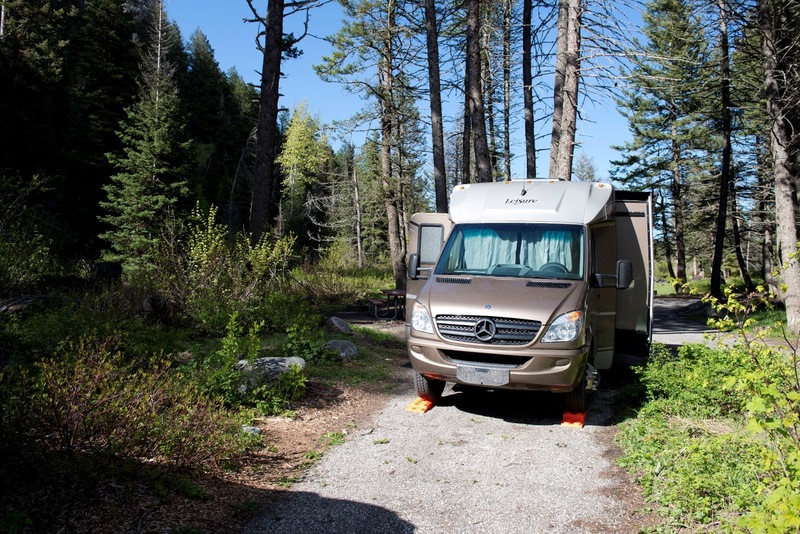 We had mechanical problems with the RV and had to stay a night more than we had wanted. We were the only RV at the "RV Park". There were some nice tent campers one night. Because we were there a while we have lot of pictures of this glacier. Better quality pictures without the "watermark" are at the "Fine Arts America" web site. We saw a few black bear in Canada. This is a picture of one of them. He posed nicely didn't he! There was a previous post of this same bear. The previous post showed Mt McKinley in the background. Pam in or on top of the Matanuska Glacier in Alaska. This was a huge thing. More pictures to follow of this glacier. The first night we crossed the border we stayed in a camp ground next to a lake. This was the view of the Alaska mountain range. Mining office, near Hatcher's Pass, Alaska. Pam struck up a conversation in a restaurant in "The Yukon". He said the had a new diesel and was hauling freight to the US. He started getting letters from the State of California because his truck did not meet their emissions requirements. He said it was a brand new truck and it was welcome everywhere else in North America. So he was simply not going to haul freight to California. He said once all the trucks stop going there maybe they will change their minds on what is acceptable. This little magpie bird was harassing this golden eagle. The eagle was pretty patient. Vanna White's job may be in jeopardy. Pam has already purchased her Holiwood sunglasses as you can see. On our trip Pam said to me one day that we would be in Alaska "tomorrow". I said, "I don't think so". So she got out the map to show me. The line she pointed to was the one that separates BC from Yukon. She thought that the line was Alaska. 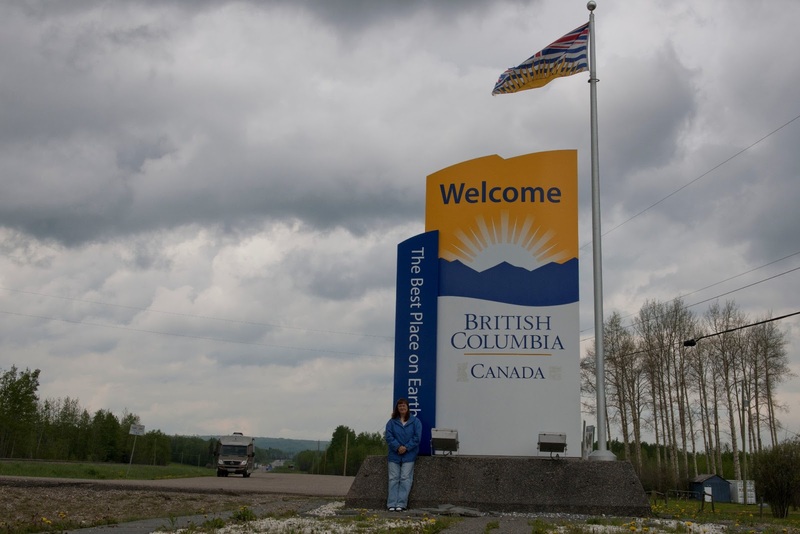 You should have seen her face "fall" when she relazied we had another Canadian province to drive through. 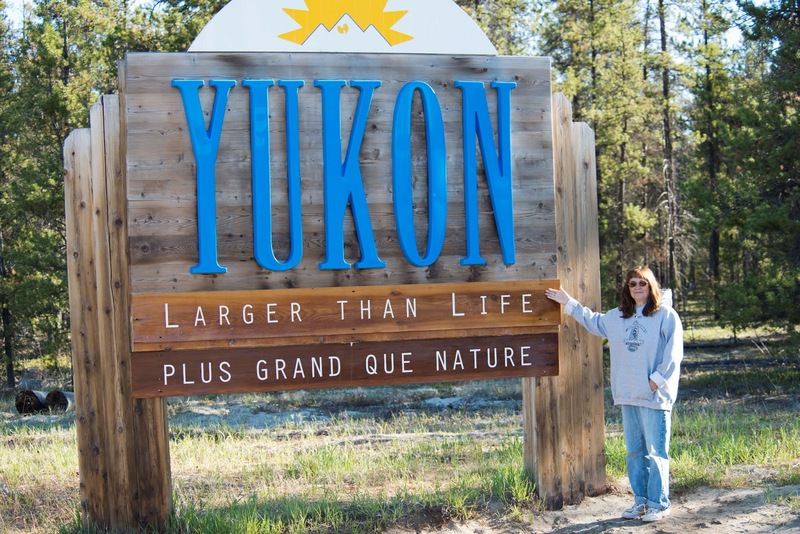 ... and the drive the last many miles to Alaska through Yukon are something else. The roads are horrible. There are no people there so there is no reason to spend money on roads. At one point they were working on the road with a disk. A big disk was disking up the road and then a big roller was rolling it back down. There was a water truck putting water on the road. I don't know if that was all there was to it, but I'd never seen them disk up a road. There were many dips and bumps and areas where the paved road disappeared into gravel and dirt. There is no rhythm that you can get into as you can with some bumpy roads. And the length of bad road is so long that it wears you out. But we made it, and Pam was in Alaska. Running along the edge of the road. A road where if you make a mistake you don't come back. This is in Danali National Park, which is 6 million acres. There is one road in and only a few vehicles get to drive down that one road. So most people (like us) get to go in a bus. So this little guy is trying to catch up to mom who has already navigated her way past the stopped bus. He made it also. Here is Pam in front of the BC sign. Normally she gets awakened and she gets out of the vehicle and gets propped up against a sign while I take her picture. I think this time she was awake. As you can see there was not a crowd at this point of the trip. Not a lot of people on the "Alcan" in May. From Shipshewana, IN it takes a long time to get to the start of the Alaska Highway. 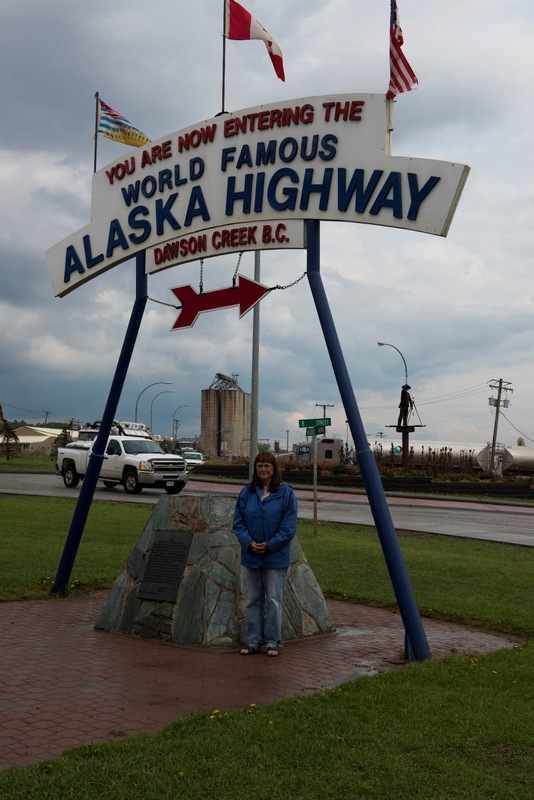 The Alaska Highway was built during WWII to protect Alaska from any potential invasion. At the time there was no way to get troops and supplies there. So Canada allowed US troops to build this road. Along the road today you see pictures in restaurants of the road being built. In some towns there are old trucks from this effort. We will post some pictures of these trucks as time allows. Another Musk Ox picture for Josh. Ice Field Parkway has a place to park RV's. It is a parking lot. That's it. And it is on a slope. There are about five places where you can park your wheels on the crest of a hill and be more or less level one way. This is one of those places where you can't see in a picture what is there. This is a stretch of road with not much round. So when you can stop this is a good place to stay put. In May there is not much here in way of services. 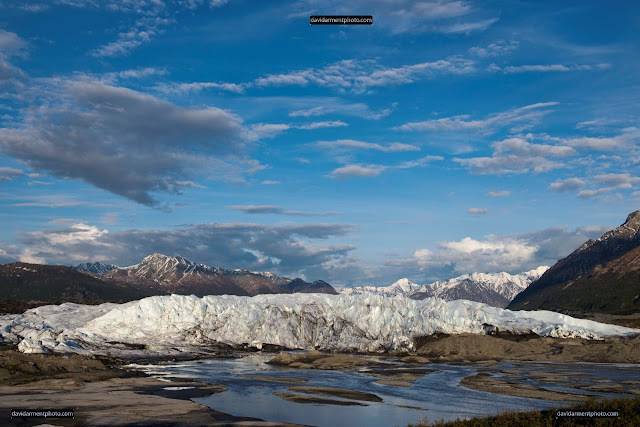 There is a ice field that feeds glaciers. So it's a cold place. This post is for Josh H. who wanted to see Musk Ox. I'll try to post another picture of them in a moment. These Musk Ox are on a farm near Palmer AK. There is another site where they are raised near Fairbanks. On the day we were at this farm it was in the 70's and you could tell it was too hot for these wooly beasts. Today it is in the 80's and I wonder how they keep them cool!!!! Musk Ox are said to have survived the Ice Age. 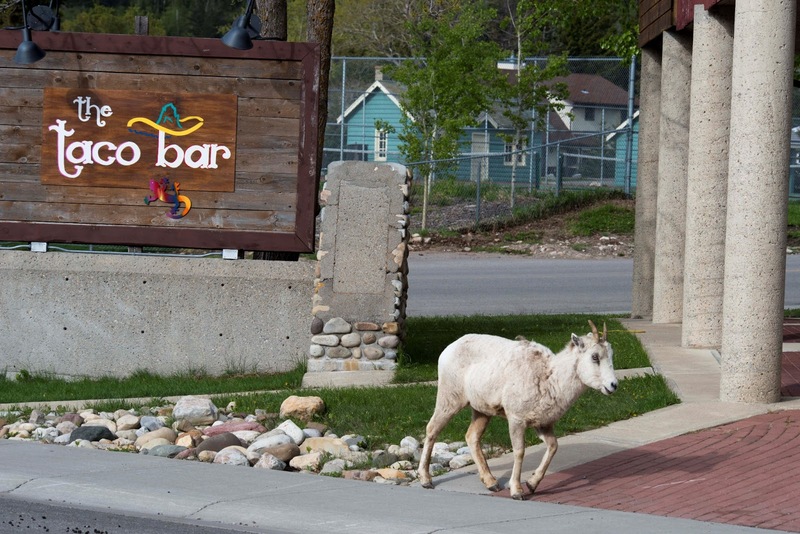 There is a new restaurant in Waterton, Canada. Pam and I ate lunch there. The next morning the goats were there also eating. You know you have found a good place when the locals eat there. Where does a 500 lb Grizzly sleep??? Anywhere he wants. This one want one of the best views in the world to wake up to. Currently the sun is up most all of the 24 hours in a day and "night" is like sunset. So why not sleep in the middle of the day. And if you are the top of the food chain whose to complain? You want to complain? Go wake him up and discuss it with him. Another of the same bear sleeping will follow if we can keep the internet signal going tonight. You can leave comments here. Click on the pencil and type away! I enjoy getting your email and Facebook messages, but you can make your comments here also and I think others would like to see what you post. This is the Willow Ptarmigan. The "P" is silent, I'm told. This is the State bird of Alaska. A town in Alaska wanted to name itself after the state bird. No one could remember how to spell the name "Ptarmigan", so the town ended up with the name "Chicken". So if / when you see "Chicken", Alaska, that's how it got its name. This guy was in a pond next to one of our stops along the road through Canada. I like this picture because it shows his tail. 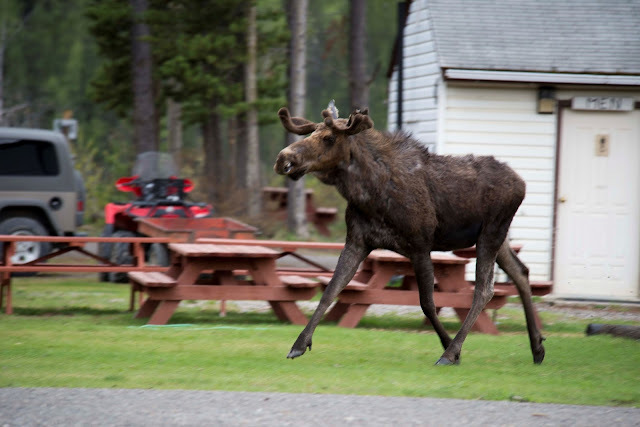 In one of the campgrounds a moose wanted into the shallow lake. I saw him come across the road. 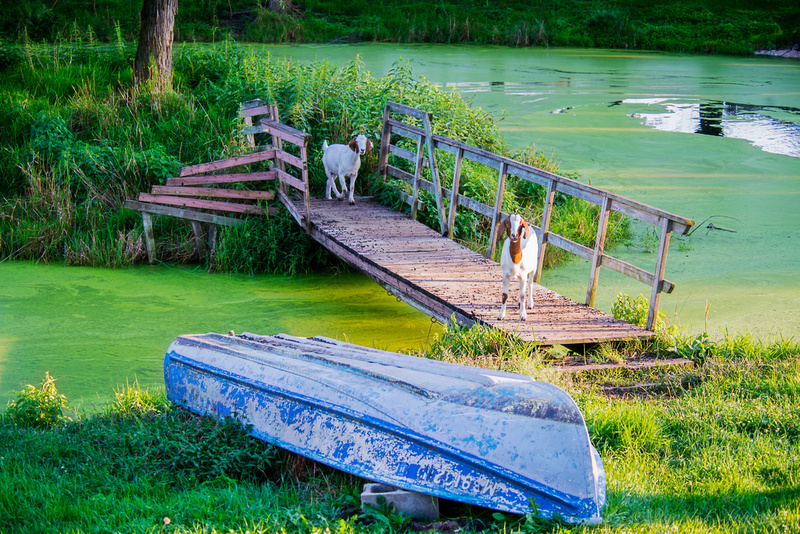 He wanted to cross into the beaver pond, but Pam was sitting there watching the beaver. So he went down the road and came into the camp. Of course all the dogs in the camp enjoyed that as did everyone with a camera. The moose panicked a bit but figured out where the lake was and waded into it leaving dogs and cameras behind. This is not a photograph posted for esthetic purposes, but just something of interest in our trip. As with other days we are having a hard time finding a internet "hot spot" in the mountains. We are currently at Denali National Park at the RV station where there is a hot spot. I sat outside in my mosquito suit and tried to fend off mosquitos in order to look at email. Pam gave up and brought her machine back to the RV. When I couldn't take it any more I came to the RV to discover the internet works here!!! Now if we just had some more juice in the battery. Our internet connections have been very difficult so the postings have been few and fat between. Tonight wont be any different as the campground tonight advertises internet, but you have to sit outside the lobby of the office and let the mosquitoes feast on you in order to use the connection. No postings tonight. This female moose had twins this spring. The one wading into the water is pretty brave. You can see the "wobble" in his legs! We watched them for some time. They were pretty interesting as they were still trying to find their legs. The prettiest drive you can make is from Lake Louise to Jasper, AL, Canada. This was one of our favorite places to camp thus far on this trip. The RV park was downtown and next to this very large lake. Waterton is a Canadian National Park and contiguous with Glacier National Park in the U.S. This odd building is somewhere along the road in Montana. Most of the time these road side signs are informative. They tell you about local history. This one was more entertaining than informative. Ray Yoder asked to see a picture of the RV, so this post is for Ray. We got a nice spot in this park because it had been windy all day long and we had fought the wind driving. This spot was right next to a mountain and back in the woods so we didn't have any wind. We were (are) early enough in the season that we have not had to worry about camping spots. This is Glacier National Park. Because we are 24.5 feet long we could not go over the pass in the park. You have to be under 21 feet. And the bus carrying folks didn't start until later in the year, so we missed a big part of Glacier National Park... at least going North. Also, as you can see we use plastic leveling blocks when needed to get us level. And you can see the slide out is "out". We took a picture of this guy on day two. 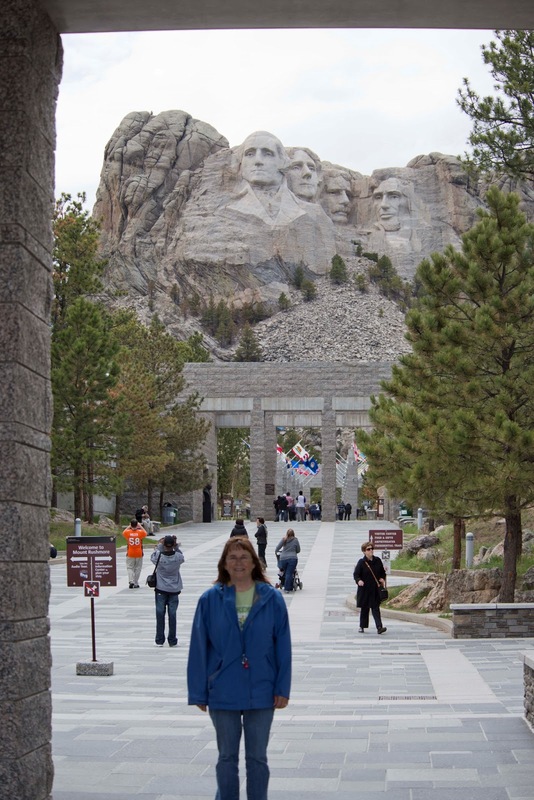 He was very much at home at the foot of Mt Rushmore. There is an amphitheater at the end of the walk toward the monument. This guy was there eating grass and was not at all disturbed by the people around. Above is a picture Pam took not far from where we stayed on Day 3. We stayed in Beaverhead Deer Lodge National Forest which is near Butte, MT. We "dry camped" out in the boonies a long way from anything. Our internet connection today won't let us upload much so we are going to have to bring you the other days when we get a better connection. Here is a picture of Pam at Mt Rushmore. She is a great travel companion. She is patient, forgiving, kind, drives an hour here and there... we should put her face up there next to Lincoln after they get the current President's face up there. Unfortunately she seems to be out of focus in this picture. We are having a difficult time with our electronics on our trip. Finding an internet connection that will support uploading of significantly sized image files is very difficult. And our wonderful Verizon cell phones do not work at all. After a visit to Verizon before the trip to be sure we understood the costs, etc the darn things don't work at all. We can't even get voice mail messages. We used Skype last night to call into the Verizon voice mail box! Today we have a good internet connection so we will try to upload some pictures and bring you up to date on where we are and where we have been. If you want to contact us, email is best.